Performing facial exercises for cheeks is probably one of the most important of all the exercises you can do to improve the face, as loose sagging cheeks can add many years to your appearance. 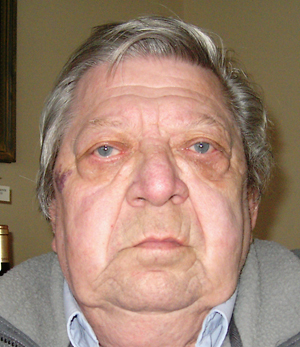 One indication commonly seen which belies the onset of sagging cheeks is the appearance of deepening nasolabial folds. These are the lines that run from the nose to the mouth corners. A cosmetic procedure that may reduce these lines is the injection of fillers. However, like other cosmetic practices it is not a permanent answer. Fillers can temporarily improve the appearance of the lines, but they do nothing to address the cause – which is atrophy of the cheek muscles. By performing the following facial exercises for cheeks regularly, you can strengthen the cheek muscles and therefore reduce the severity of nasolabial lines. The Cheek Developer is one of many effective exercises from Carole Maggio’s Facercise. Carole was a qualified beautician with a thriving practice when she began to research ways to fight aging after her husband told her she was aging badly. Now well in her sixties, Carole looks to be around mid-fifties, and the I believe the husband is now an ex, although I may be wrong there. Sit on a chair, holding your back erect. Imagine there is a dot in the center of your lower and upper lip. Wrap your lips over your teeth, open your mouth and imagine the two dots are being pulled apart, but still facing each other. Place the sides of your index fingers lightly on the apples of your cheeks. Without moving your lips away from your teeth, try to smile widely, then relax. As you smile, you will feel your cheeks lifting beneath your fingers. Repeat the movement 35 times in quick succession, twice daily. Deborah Crowley is another of the earlier producers of a long-standing facial exercise program. Deborah is now in her early sixties, but like Carole Maggio looks about 15 years younger. Her “Flex Effect Facial Resistance” training method was originally released in 1979, and these days as well as selling the program, she runs an online training course for those who wish to become certified Flexeffect trainers, as well as maintaining a busy online discussion and help forum. Deb’s Flex Effect program provides several facial exercises to lift sagging cheeks. The “Cheek Raiser” is an easy routine that can be performed just about anywhere – but maybe better when you are alone, unless you don’t mind receiving curious looks. Place the three middle fingers of each hand on top of the fleshy part of the cheek, just underneath your lower eyelids. Press downward, and hold firmly. At the same time, open your mouth and contract the muscle as though smiling. Hold the pose while counting to six, and repeat ten times. Louise says that by exercising the cheek muscles, and therefore lifting the cheeks, the whole face will regain a youthful look, as the rest of the face “hangs” of the cheeks. She recommends an easy exercise she named the “Cheek Lift.” Using whatever grip feels more comfortable (I use my thumbs and the sides of my index fingers) grab as much flesh as you can vertically alongside each side of your nose, just under the center of your eyes. Contract the cheek muscles, and lift your cheeks up to the eyes. Hold for a few moments and relax. Repeat 20 times, every other day.